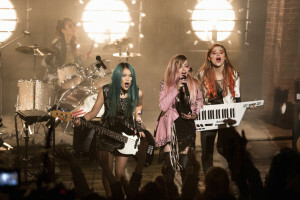 While there is plenty of glamour, glitter, fashion and fame showcased in director Jon M. Chu’s live-action JEM AND THE HOLOGRAMS, there’s also a creative sense of ingenuity when it comes to transforming the animated TV series’ legacy. This iteration of the rock star most girls my age dreamt of becoming is grounded in a modern reality, telling a part fantasy, part coming-of-age tale retrofitted for today’s internet-savvy zeitgeist. It doesn’t “ruin” anyone’s childhood, nor does it tarnish anything its predecessor has done for fans. In fact, it’s incredibly true to the show’s iconography and narrative themes of female empowerment. It does right by the genre and prequels in general, managing to be its own unique entity – with loads of humor and heart. Jerrica Benton (Aubrey Peeples) is just a shy, suburban girl with a crippling case of performance anxiety when we first meet her. As she explains in a video confessional, her father, and inventor/ dreamer, died when she was young. He left her and little sister Kimber (Stefanie Scott) in the care of Aunt Bailey (Molly Ringwald), a struggling store owner with two daughters of her own – badass smarty Aja (Hayley Kiyoko) and fashion-forward Shana (Aurora Perrineau). She’s raised the girls to be a cohesive unit, harmonizing as a way to defuse sisterly arguments. Life changes drastically when Jerrica, hiding behind her self-created alter-ego “Jem,” records a video of a folksy pop song and literally becomes an overnight sensation. 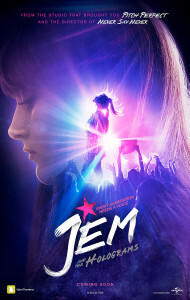 This leads to the attention of the all-powerful owner of Starlight Enterprises, Erica Raymond (Juliette Lewis), who wants to capitalize on Jem’s newfound global recognition. Realizing Aunt Bailey needs a quick infusion of cash in order to keep the family home intact, Jerrica agrees to be made over into a superstar – only with her 3 sisters in tow. With Erica’s hot intern Rio (Ryan Guzman) overseeing the girls, everything seems to be falling into place. However, as the girls revamp their images, the Bentons’ father’s unfinished “greatest creation” 51N3RG.Y (that’s Synergy, to you) activates, revealing elaborate clues to unlock a mystery, guiding them into a journey of personal discovery. Aurora Perrineau, Hayley Kiyoko, Aubrey Peeples and Stefanie Scott are JEM AND THE HOLOGRAMS. Courtesy of Universal Pictures. Chu, along with screenwriter Ryan Landels, shows extreme reverence for the TV series, perfectly placing callbacks throughout. They land here and there but aren’t precious, cumbersome or obtuse. They spin their cover tune, if you will, into a refreshingly solid genre picture. Yes, it gets a little schmaltzy, but it’s also disarmingly sweet and fun –welcome elements in a music-based drama. Splicing in YouTube artist videos during Erica’s email courtship, pursuits and face-offs are a clever technique to incorporate authenticity. Getting the gang from point a-to-b integrates internet tech (i.e. Google Maps). Astute superfans will also notice (and clap like an imbecile like I did) when Jem’s TV series singing voice Britta Phillips (SATISFACTION) appears in a touching “passing of the torch” type blink-and-you’ll-miss-it cameo (see also when series creator Christy Marx and Jem TV series speaking voice Samantha Newark make their lightning quick cameos). Plus, make sure to stay for the mid-end credits tag – it’s like pure glee-filled, Marvel-level nerding out for series fans. Peeples, Scott, Kiyoko and Perrineau feel like a group of real friends we’re seeing – not “movie friends.” They share an undeniable chemistry. But who really steals the show is Lewis. She brings her bonafide rock-star swagger to the fold and plays it to the hilt – never going campy. Her version of a Ra’s-Al-Ghul-esque character in this origin story exudes charisma, sass and dedication. After Guzman had middle-aged women salivating over his abs in THE BOY NEXT DOOR, he will get teen hearts palpitating in this. Chu makes sure to represent the female gaze hard. Though this isn’t a perfect film – what with its stereotypical “you lied to me? !” moment, semi-clunkily-handled mystery (replete with an EARTH TO ECHO-ish robot) and basically anything involving Jem’s earrings – it will hit with many audiences. Its target teen demo will adore the makeover montages and swoony romance. Adults will value the ethnically diverse ensemble (though it doesn’t draw attention to itself), incredibly catchy and light-hearted pop songs, and possibly the father-daughter angle. And everyone will cherish its message about individuality, courage and confidence. JEM AND THE HOLOGRAMS opens on October 23.